It is a St. Francis Healthcare System tradition to remember our loved ones who have gone before us during the holidays. Join us as we usher in the Christmas season with St. Francis Hospice’s annual “Light Up a Memory” tree lighting event. Celebrate this season of hope and joy by surrounding yourself with friends to enjoy entertainment and pupu, while also reflecting on the important role of St. Francis Hospice. The “Light Up a Memory” is a fundraiser for St. Francis Hospice to help patients and families in need of hospice care and bereavement support, and to further develop our hospice program to serve more families. One of the highlights of our Light Up a Memory events is our Christmas Tree Blessings. A star with the name of each of your loved ones will be hung on one of the trees on the lawn. Click here for more details. 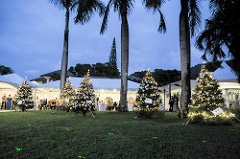 To see photos of last Friday’s “Light Up a Memory” event at St. Francis Hospice in Nuuanu, click on the photo above.